We are pleased to report that Vectis Marine Design has moved to their own new offices. 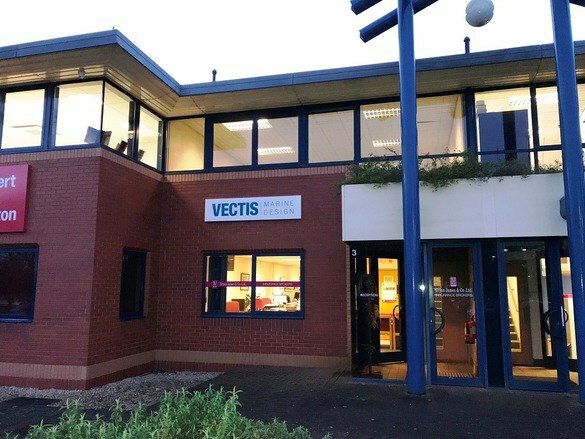 Vectis purchased the offices in January this year and has now moved in following four weeks of refurbishment. The office is located near Fareham in Hampshire, just off Junction 9 of the M27, with convenient access to the motorway routes and Southampton airport. The modern two-storey office block is large enough for Vectis to occupy the first floor with our tenants, a separate company, occupying the ground floor. The refurbishment has created new offices, kitchen area, toilets and shower all to a modern, high quality standard. Our new address is; 3 Manor Court, Barnes Wallis Road, Segensworth East, Hants, PO15 5TH Please drop in when you are passing. Visitors are always welcome.